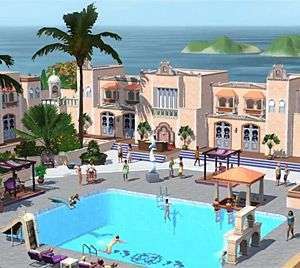 With The Sims 3 recently announced to be standing politely aside for a fourth iteration next year, the release of expansion packs certainly hasn’t slowed down, with EA causing a buzz back in January with the announcement of not only the recently released University Life, but a very ambitious-looking expansion, The Sims 3 Island Paradise. This pack, due to hit store shelves in June, is centred around island life in all its lazy, hedonistic glory, as the Sims team jerk back the cover from a new world, Isla Paradiso. Rather than being just a regular holiday resort, the team have endeavoured to provide a little something for everyone, from managing resorts and building them into five star holiday destinations, to slacking off on the beach and exploring – both on and under the water. As expected, we had a few questions and Ryan Vaughan, Lead Producer was happy to answer them. Jetting to and from various islands in a speedboat or Aquasled isn’t the limit of the aquatic transport opportunities on offer, as the developers have decided to take life on the ocean waves a step further with the introduction of houseboats. These are completely customisable and the hulls come in a variety of sizes to (hopefully) suit most families. 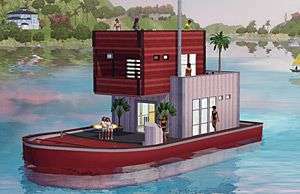 They can be pimped out in exactly the same way as a regular land-locked dwelling and are fully functional – you can slap down fireplaces, cookers, TVs, barbeques, and more, with the bonus that your whole floating home can double as transport. If you get bored being moored at the dock of one island, you can take to the waves in search of fresher pastures, even stopping en route for a swim over the side. More sadistic players will be wondering if you can take off and leave a Sim behind or pull a ‘Robert Wagner’ – you can, but they will miraculously find their way back to land by way of convenient speedboat. These speedboats and Aquasleds are not solely reserved for your use, or for plucking Sims from Davy Jones’s Locker, however, and are utilised by all manner of service Sims, meaning that if you’re in the middle of the sea and fancy a pizza, you’ll still get a prompt delivery without your cheese going goopey. How’s that for service? Buying a boat works rather like purchasing a car, only this time you need a trailer in order to set one down, as opposed to the right sized driveway. If trawling around in a houseboat doesn’t suit your style, then jet-skis and sailboats are also available, adding to a swelling list of adventurous pursuits on offer, which also include water-skiing and windsurfing. But perhaps more exciting than overseas thrills, are the new snorkelling and scuba diving activities. 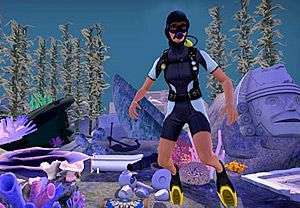 While they are only available in designated dive locations, Sims will be able to explore the briny deep for the first time in a number of “exclusive underwater dive lots”. Anyone else feel a new death coming on? Well, the developers have hinted at a shark-related death, stating that “if your Sim is going to be spending a lot of time in the water, it may be wise to provide them with the ‘Loves to Swim’ trait to help defend against sharks and other creatures lurking in the dark depths of the underwater world” Unsurprising but amusing, although before you go rushing back to Amity for a bigger boat it may be well worth indulging in some scuba diving, because in addition to a variety of marine life, is the possibility of discovering sunken treasure or uncovering the underwater cave (also providing one of the game’s three new WooHoo locations – the others being the new all-in-one bathroom and the resort tower[more on that later]). Perhaps the biggest draw for some players will be the new NPC life forms: Merfolk. Never-before-seen in the Simverse, these NPCs, according to Ryan, “can be brought into a Sim household” meaning that they will be playable, although other details are very sparse at this point, with the team staying very tight-lipped. That said, expect them to have some unique traits and interactions including the expansion’s new trait: Loves To Swim. Purchasing is the easy option for players who just want to jump straight in and is as simple as snagging a home lot, where you will likely have to fix a few things and change the décor, but it is the best option for those looking for a quick start. If you want to get stuck in on your own you can go right ahead, with a number of items in Blueprint Mode making life easier. VIP rooms and beach bungalows can be slapped down with a few clicks, or you can simply work from the ground up on your own lavish creations. The chance to fully customise your resort is very much there, however, there is one staple that can’t be omitted – the resort tower. This rabbit hole acts as the main hub of your resort, includes essential facilities, such as toilets and beds, and can be upgraded three levels (which can unlock extra amenities, such as a spa). From the resort tower you can manage your new business, setting prices, hiring staff, tweaking uniforms, and viewing your resort rating and guest comments. Not only that, but players interested in more in-depth management can get stuck into the finances, viewing lists of all amenities, operational costs, employee costs, drink specials, etc., making it the keystone to managing your new venture. Of course, the guests are where it is at, with your precious rating in their sunscreen-smeared hands, so how do you tell if they are happy? Check out your feedback and take a look at their complaints, demands, and suggestions. Whether or not you choose to act on these is up to you, but if you want to reach the dizzy heights of five stars, you had better be prepared to give in to a little whining. There is no option to just drown them, sadly – The Sims could take a leaf out of Rollercoaster Tycoon‘s book here. Any good resort will have a host of activities and amenities on offer and the more diverse the range the better your rating is likely to be. Pools, slides, bars and more are all good options, and you can even hire a bartender (among other essential staff such as pool cleaners, etc. ), to tend bar and keep the guests happy. So who cares about star ratings? You if you want better reviews and therefore more popularity and cash. Cash is good. One thing we were curious about was the impact that celebrities could have on a resort. After all, if a five star celeb comes to stay, could it boost your rating? “Celebrity Star ratings won’t have a direct effect on your resort, but just like with any Sim, the more you have checked into a resort, the more popular it will be, and the better it will be rated. If you check a Celebrity into a resort with a large entourage of Sims, it will definitely help the rating out.” Seems like something of a missed opportunity, but it does mean that you need to put in the graft, rather than relying on celebs for a cheap boost. Better news is that resorts aren’t restricted to Isla Paradiso, so if you don’t fancy the Island Paradise world, but still want to play host, then you can run a resort in any world you like, such as Bridgeport or just good old Sunset Valley. For many players, we suspect that the enjoyment will very much lie in themeing and customisation. You don’t want the place looking like a slightly shabby version of Butlins, after all. You could opt for a family friendly resort, a romantic retreat with more palm trees than you can shake a positive pregnancy test-stick at, or a raucous 18-30′s nightmare, with staff dressed in degrading costumes and juice kegs galore. This is where those extortionate Sims Store packs could truly prove their worth, allowing you to have a cutesy fairyland resort, a Steampunk holiday destination, or a pirate-themed beachfront business… personally, we’d prefer a Jurassic Park-style place, complete with Velociraptors, but somehow we don’t see it happening. At least there is the option for Sims to own multiple resorts, according to Ryan, so if you can’t quite choose between Hogwarts by the sea or a futuristic theme, you can opt for both. Building up a resort isn’t the only thing in this expansion that will likely appeal to the build/buy players as there have been some interesting additions in this area. A new lot type has been introduced, which is half water/land, allowing players to build houses out over the sea, thanks to stilted foundations, allowing for some truly luxurious or inspired creations. Just a shame that evil Sims won’t be able to include trapdoors… now that would be enjoyable. Additionally, thanks to blueprints, pool construction just got a whole lot easier, with blueprints of various pieces available, meaning that you can simply drop them down, connecting up whatever shapes you select to form intricate pools and even ‘pool rivers’, circles, or horseshoe-shaped pools. Just select, drop, and they will automatically be dug out, saving hair-tearing levels of faffing about. With the meat and potatoes there, there are still a few odds and sods thrown in to pad things out, with more Create-A-Sim styles, tattoos, and hair, beach activities, and objects such as the Fire Pit (which steadily builds a minor skill for participating – if you don’t get burned to a cinder first). Add to that new traits and a new career – Lifeguard (Hasselhoff jokes on standby) – and it would appear to be a pretty solid package. Of course, we won’t know until the June release whether it is as satisfyingly in-depth as we have been led to believe, but it certainly seems to be going all out, packing in something for everyone and introducing new elements that have never before been seen in the Simverse. Could this be the best Sims 3 expansion yet? The coroner is returning an open verdict. Well, I’m SUPER excited for this expansion! !